Daycare centers are supposed to look after and care for children so when a child goes home with bruises, especially on their face, it should be of great concern. The State of Texas has created regulations for daycare centers so incidents such as these don’t happen. One of the many regulations is that there can only be a certain amount of children assigned to a teachers based on age so they can all be taken care of properly. The child to teacher ratio for the one-year-old category should be 5:1. One-year-olds are a handful, which is why the number is so low. At this stage kids don’t know how to make full sentences. It would be impossible for parents to know how their baby got an injury if a caregiver didn’t see what happened. When the mother went to go pick up her baby, D.B., from Armadillos to Zebra daycare, she noticed his face was red and swollen. When she asked the daycare facility what happened the mom was told that another child had hit D. B. in the face. Later that day the child’s face went from “red and puffy,” as she described it, to bruises and dark red lines going down his cheek. These lines resembled a hand print. Armadillos to Zebras provided the mom with an incident report which stated that D.B. had fallen and “hit his face on a toy.” They never showed the mom what toy or what kid had injured D.B.’s face. The mom took pictures of her child’s face and posted it on Facebook. The picture was shared a total of 50,000 times within a 24-hour span. Parents who had previously had their kids at this daycare left reviews about all of the negative experiences their child had dealt with when enrolled. Some previous students from this daycare even gave their honest opinion on their services. This is why it’s so important to report any suspicious behavior, it will be able to help another child and parent in the long run. The mom has described this situation as “scary for [her] as a parent” to think that her baby is being physically abused at daycare when she has “to go to work” and doesn’t have another option for childcare. To read more of this story follow this link. When your child has been injured at a daycare facility the first step you’ll want to take is seek medical attention. Children don’t have the ability to express their pain so a doctor will be able to inform you of any hidden/deeper injuries. Check out our article on what to do after: How To Hold The Daycare Responsible For My Child's Injury. 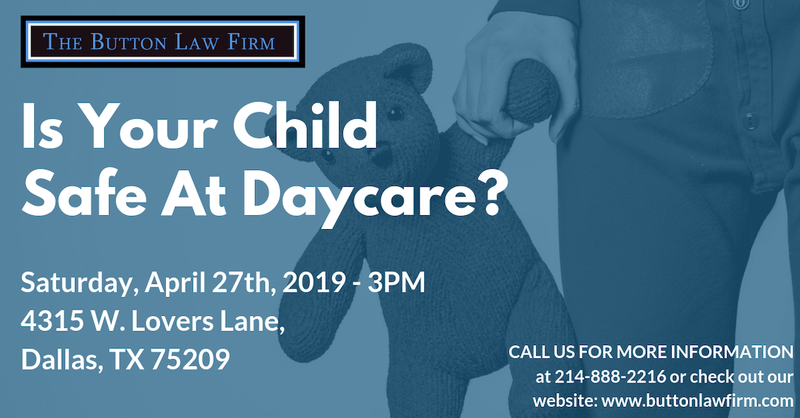 Give us a call at 214-888-2216 if your child has been injured in any Richardson daycare centers, we want to help you through the proper steps in ensuring that you get the answers you want and deserve. You can also fill out our Contact Us form and leave us your story. We will get to you as soon as possible.